Add ease to your everyday laundry routine with the Neu Home Laundry Center w/ Garment Rack & Triple Sorter Hamper. This compact laundry center features three removable canvas laundry bags perfect for sorting whites and colored laundry; keeping them organized until ready for the washing machine. 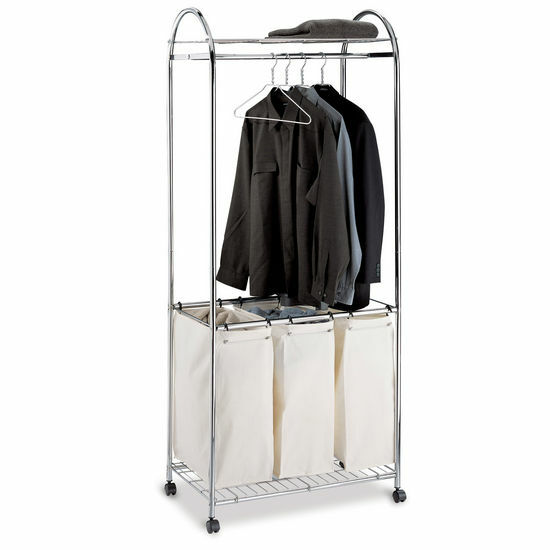 A sturdy garment rack is ideal for hanging clothes to dry or holding garments that have just been neatly pressed. With an upper wire storage rack for supplies or placing folded clothes, the Neu Home Laundry Center will soon become a laundry room essential. 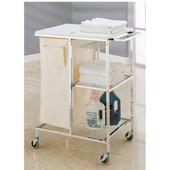 Rolling caster make it simple to glide from bedroom to bathroom and more with everything you need all in one. Available in a sleek chrome finish with ivory canvas laundry bags. The Laundry Center from Neu Home is sure to simplify your laundry needs. Well made and easy assembly .Very sturdy, much more so than the pvc one we owned before!